Right: A video montage of one of our dives on the AquaCat - The Washing Machine - a favourite for all. This AquaCat adventure offers a large variety of dives; thrilling shark encounters, mysterious blue holes, high speed drift dives, painted walls and shallow patch reefs. Meet the local friendly grouper, and abundant fishes inhabiting these beautiful reefs. We will be cruising from Nassau, Bahamas to the remote islands of the Exumas and the Exuma Cays Land and Sea Park, the most pristine area in all the Bahamas. Your adventure vacation is aboard the 102’ catamaran Aqua Cat. The ultimate escape aboard your own private luxury yacht. You will have a great time exploring the 200 mostly uninhabited islands with their many beautiful beaches in the northern Exumas. The Aqua Cat has a 28' launch that can take you to isolated beaches where you can sunbathe, explore, kayak, snorkel or fish. The Aqua Cat offers luxury accommodations, a spacious main salon and an extremely smooth ride. She cruises at a speed of 14-knots getting you to the uninhabited islands of the Bahamas and dive sites quickly while her 35-ft beam will ensure a smooth ride. The eleven passenger cabins are some of the largest of any liveaboard in the world with their own private bathroom and shower. 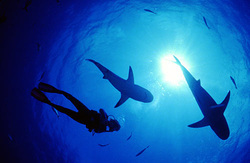 Many of the dive sites you will visit are frequented by Caribbean Reef Sharks and Nurse Sharks. You can also see Lemon Sharks at the Land and Sea Park. And don't miss out on the shark feed dive usually offered during your vacation. You will experience truly virgin diving in the Exumas. For over 30 years, much of the northern Exumas has been a National Underwater Park with no fishing, spearfishing or collecting allowed. Because of these laws there are miles and miles of undersea gardens. The reefs are perfect for snorkeling with gin clear waters and lots of fish. If you aren’t a certified scuba diver, come into Adventure Sports Newmarket and find out how easy it is to learn and add this fulfilling skill to your repertoire of fun! Photographers will find underwater life in the Exumas some of the most prolific and varied of any coral reef in the world. Build a stunning photo-portfolio of some of the most beautiful marine life and pelagic landscapes you will ever see! Lost Blue Hole - The rim of this large blue hole lies in 40' of water surrounded by coral heads, sting rays and many schools of fish. There is a lobster filled crevice at 80'. 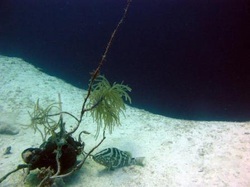 In the sand surrounding the hole, divers will find many small fish such as banded jawfish, Seminole gobies and tobacco fish. There are usually 1 or 2 nurse sharks here and during the late spring/early summer a large school of blacknose sharks inhabits the bottom of the 200' hole. This site is normally visited on the way to or from the Exumas. This is the location of the Caribbeans first lionfish sighting. Periwinkle Reef - This is a shallow patch reef that is teaming with fish. The local Nassau operators feed fish here, so sergeant majors and angelfish will approach scuba divers looking for a handout. Amberjack Reef - A 50' patch reef that has prolific fish life. 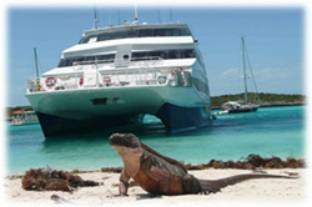 You will see reef sharks and up to 10 large grouper. This dive also has many interesting small critters such as pirate blennies and garden eels. Back on the hang bar scuba divers will be surrounded by a school of 100+ horse-eye jack that hang out under one of the Aqua Cat. Austin Smith Wreck - A 90' Bahamian Defense Force Cutter that sank in 1995 while being towed to San Salvador to be sunk there as a dive site. Their misfortune was our gain. This intact wreck lies in 60' of water. Barracuda Shoals - This bankside patch reef has huge schools of fish as well as many small critters on the reef and surrounding sand. Lobster No Lobster reef just to the north is very similar. Blacktip Wall - Hammerhead sharks have been sighted frequently on this wall. This reef is also where Ned Deloach (Reef books co-author) found the very rare lemon goby. Cathedral - This site is part of the Dog Rocks Reef. This reef starts at 35' and slopes off to 50' before dropping straight down into the Exuma Sound. The Cathedral is a large swim-thru where the light filters down from above reflecting off the thousands of silversides that occupy the swim-thru. This swim-thru has many grouper and jacks that come to feed on the silversides. This is one of the crews favorite dives. If you like to identify fish, you will marvel at the large variety of fish. The wall has large stands of black coral and orange elephant ear and tube sponges. Pelagics, eagle rays and sharks are frequently seen off the wall. Cracked Coral Head - This massive coral head rises 40' off the bottom. Several large swim-thrus make it looked like it is cracked. Jeep Reef - This is one of the prettiest reefs you will ever see. The strong current that sweeps through this cut keeps the reef 's corals very healthy. This dive can only be done at slack tide because of the strong currents . 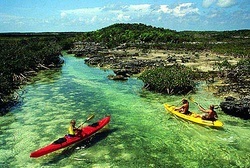 It is in the middle of the Exumas Land & Sea Park, so you will find a very healthy population of fish. This dive site gets its name from a coral encrusted jeep that sits near the mooring. Pillar Wall - One of many excellent wall dives. It starts at 30' and slopes to 50' before dropping 5,000' to the bottom. There are many caves and crevices. There is a large colony of yellowhead jawfish in the rubble inside the reef. Wax Cut Drift - Divers and Snorkelers alike fly over this 30' reef at over 2 knots. You will see rays, sharks, eels and numerous fish as you drift with the current in the cut between the islands. The sheer density of staghorn, pillar and finger corals is amazing. There are several other similar drifts dives we do such as Hammerhead Gulch and Coral Cut. The Washing Machine - The strong incoming tide of up to 6 mph takes scuba divers thru a narrow cut where water drops off a ledge and then makes a sharp bend to the left. This causes the water to swirl like the water in a washing machine. This swirling water will toss scuba divers head over heels. Scuba divers who wish to avoid being tossed around can stay to the right where you will have a smooth fast trip through the cut. After passing through the cut you will then glide over a large patch reef. Enjoy the ride! Whale Tail Wall - A great wall just south of Wax Cut. Large parrotfish roam the sand inside the reef while sharks & eagle rays are frequently seen off the wall. We have had some very unusual sightings here like a Caribbean torpedo, one of only four sightings of this very rare ray. Cave Rock - A large coral mound in 50' of water surrounded by several smaller coral heads. There are several caves where you can swim from one side to the other. The large variety of corals and fish will amaze you. We have frequently seen Hammerhead Sharks here. Hole in the Wall - The walls in Southwest Eleuthera are some of the most abrupt & beautiful anywhere, literally going straight down. At this site there is a hole just inside the edge of the wall that drops 15' with a swim-thru that heads west before popping out of the wall. Jake's Hole - This tidal blue hole lies in 20' of water. The highlight of this dive is the vibrant corals surrounding the hole. Because it is very tidal, scuba divers aren't permitted to enter the hole. Monolith - Large mounds of coral rise out of the sand at the edge of the wall. They start at 100' and rise to 55'. There is a colony of Garden Eels in the sand next to the mounds. Cave Reef - This 40' shallow patch reef has several large swim-thrus cutting through the middle. Empress Pinnacles - This wall dive features 30' high pinnacles coming out of the sand at the edge of the wall. Peligics are seen frequently in the clear water off the wall. There are large stands of black coral on the sides of the pinnacles. Imagine sinking your toes into sugar sand, snorkeling or diving among the lemon sharks and sting rays, or kiking the trails of pirates and bootleggers of years gone by. No crowds. No set itinerary. Nothing to do but sit back, relax, and choose from an incredible variety of activities including scuba diving, snorkeling, kayaking, fishing, sunbathing, and island exploring. Call Adventure Sports Newmarket today and find out when we cruise on THIS awesome adventure! Check out this page to see even more details about the adventures that await you aboard the Aqua Cat! Awesome! Check out the details about these cuddly creatures on Aqua Cat's shark info page; the species they have spotted!